Overhauls the vanilla cooking stations with better effects and features; adds several new ones including a working kitchen stove, BBQ grill and supermutant cooking pot. All craftable cooking stations can be toggled Private or Public and can be assigned to settlers to function as food traders while still allowing you to craft recipes. Translations of this mod are permitted without needing to ask me, provided you only upload the translated esp and not the whole assets. Compatibility patches are permitted as long as no assets are included in the patch. Translations and compatibility patches based on this mod are permitted to earn Donation Points. If I have given you permission via PM to use assets from this mod, then you also have permission to earn Donation Points using those assets. Made using Nifskope, FO4Edit, Creation Kit, Material Editor, Caprica, Photoshop CC and Audacity. - Stoves assigned to settlers now give a settlement food bonus as intended. - The "I need to assign someone to this" player dialogue is now suppressed on private cooking stations. - Removed the ESM flag from the mod so it can be organized properly in the load order. - Fixed missing shimmer effect on the swinging pot cooking fire. - Fixed mod conflict issues at Red Rocket and other settlements that had hand-placed fires beneath cooking spits. - Settlers can now be assigned to work at cooking stations and will become food vendors, while the stations can still be used by the player for crafting! - Assigned cooking stations (excluding kitchen stoves) can be destroyed during raids. - Each assigned cooking station type is given a unique container and leveled list for more varied food trading. - Cooking stations that have been assigned to settlers give settlement food and happiness bonuses. - Added a condition to the "It's growing well" dialogue so it won't play when using cooking stations that give food bonuses. - New food categorization: ROAST, SOUP, GRILL, FRY, POACH & BOIL, STEAK, OMELETTE, STEW, SKEWER, BAKE, BEVERAGE, UTILITY. - Logical cooking system: you can't craft soup or omelettes on roasting spits and BBQs, or cook grilled steaks in soup pots, for example. - Recipe for purified water moved from BEVERAGES to UTILITY, and 1 dirty water produces 1 clean water. - Vanilla and DLC cooking recipes now use purified water instead of dirty water. No need for a separate mod to do this. - Added new recipes to craft cooking oil from corn, razorgrain, mutfruit, gourds and melons, including all wild varieties, plus glass for the bottle. Cooking oil now scraps into oil + glass instead of oil + plastic. - Added new cooking recipes for Blamco Mac and Cheese, Cram, Fancy Lad Snack Cakes, Insta Mash, Pork'n'Beans, Potato Crisps, Salisbury Steak, Sugar Bombs, Yum Yum Deviled Eggs and Bobrov's Moonshine. - Added new recipes to turn wild or vault ingredients into regular ingredients. No need for a separate mod to do this. - Added an Easter egg food item Soylent Green included in some food trader leveled lists. - A Far Harbor patch for its new recipes and ingredients. Applied the new recipe categories and logical cooking rules. 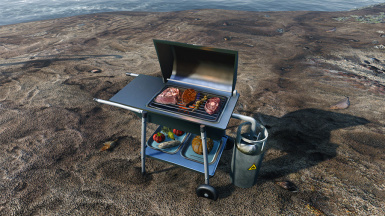 Added a fully working craftable Far Harbor picnic grill with fire, smoke and sound effects. I shortened the pedestal to make the model fit the player cooking animation without clipping. Added an alternative cooking spit with a Far Harbor dead buck roasting on it. - Made a Nuka World patch for its new recipes and ingredients. Applied the new recipe categories and logical cooking rules. - Made an all-in-one patch for Wasteland (Mojave) Imports, including my Far Harbor and Nuka World patches. - Made a compatibility patch for Choice Chopped. - Made a compatibility patch for Logical Recipes. Bonus: the patch also updates Logical Recipes to be compatible with Survival Mode. - Made a compatibility patch for Have a Beer - Animated Drinking. 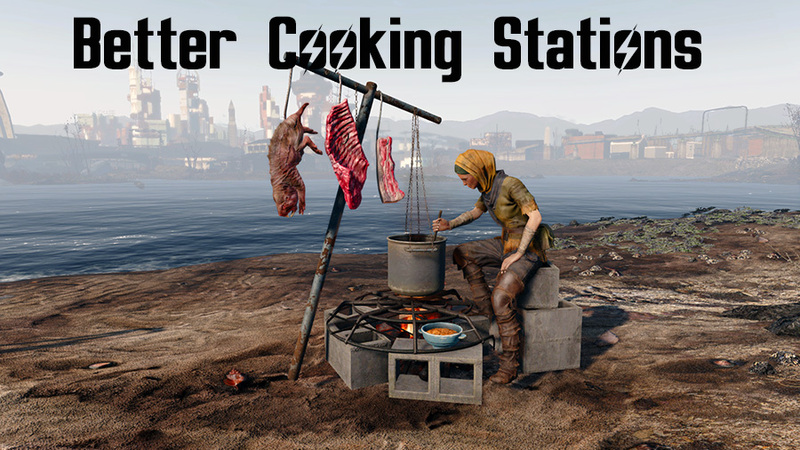 This mod overhauls all the cooking stations to add better features, and adds several new cooking stations as well. You will find them under the Crafting workshop menu - they have [BCS] appended to their name for easy identification. All craftable cooking stations can be toggled Private or Public to prevent NPCs from using them, so you can reserve them exclusively for you and your followers. This also helps to prevent settlers from sandboxing into your player homes and using your stations. In v2.0 you can also assign settlers to work at each cooking station, and they will become food vendors. You can still craft recipes at cooking stations that have been assigned to settlers! Assigned stations will add to settlement happiness bonus and food supply. All cooking stations have built-in working fire with sound, smoke, heat shimmer, embers, sparks, flickering light and shadows. Adds a permanent fire beneath the craftable cooking spit, plus new sizzling sounds. The vanilla spit was unimmersively missing a fire. Also replaces all pre-built cooking spits placed in-game. Adds a new craftable cooking spit with an FEV Hound roasting on it. Adds new animations to the cooking pot so that it swings on its chain, with slabs of meat swinging on meat hooks. Also replaces all the pre-built cooking pots placed in-game. 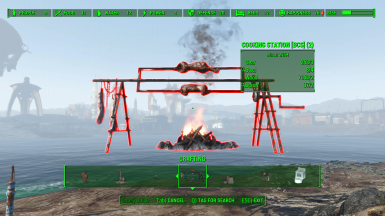 Adds a new cooking station based on the supermutant cooking pot, remodelled to adapt to the player cooking animation. Adds gas flames, oven glow and smoke to the cooking stove, plus additional clutter for eye candy. Adds working pre- and post-war playerhouse kitchen stove cooking stations with glowing stove element and oven. Sizzling steak cooking animation with sound. A step has been added to the stove so the animation won't clip. These stoves require power to work (just place a live connector near the stove). Bonus: the stoves are snappable with Modular Kitchen. Adds working pre- and post- war gas BBQ grill cooking stations with new models and textures (glossy black and chrome color), plus gas flames, smoke, flickering lights and shadows etc. Sizzling steak cooking animation with sound, carefully adapted to avoid clipping. Does not affect vanilla grills. Adds a small fire under the small cooking pot, plus stew in the pot. Vanilla had no fire effect and the pot was empty. The cooking stove, cooking spit and cooking fire no longer require the Local Leader perk for crafting. It wasn't logical to require this perk anyway. Mod is compatible with all my other mods that affect fire lighting. This mod uses custom lights and won't affect other lighting mods or be affected by them. 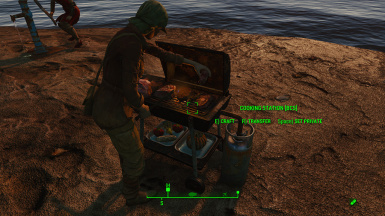 If you use the Far Harbor or Mojave Imports patch you will get a new craftable working picnic grill and a new Roasting Spit with radstag buck roasting on it. In v2.0 new recipe categories have been introduced along with a new "Logical Cooking" system - certain recipe categories will only be available on certain cooking stations e.g. you won't be able to make soups or omelettes on a roasting spit, or cook steaks in a cooking pot. Sometimes followers won't use the stations when commanded. You just have to keep trying, it's a game pathing glitch. You could also try moving the cooking station to another location, as it might be an issue with the vanilla navmesh at that spot. Sometimes certain smoke and spark effects won't appear as expected. The game engine tends to cull some effects in certain settlement locations for better performance. 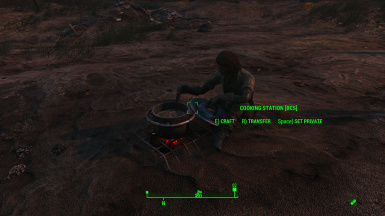 Load Better Cooking Stations AFTER Orphans of the Commonwealth, if you use it. Orphans of the Commonwealth unnecessarily edits cooking stations, creating conflicts. LOAD ORDER: Place Better Cooking Stations high in your load order but after Orphans of the Commonwealth. Place Mojave Imports, Logical Recipes, Animated Drinking and Choice Chopped after Better Cooking Stations. Then put the patches after those mods. If you can't cope with all the new features and possible incompatibilities, the original v1.0 version is still available for download. See 5:38 in the excellent video review by It'sAGundam. The second video is by The White Collar Players. 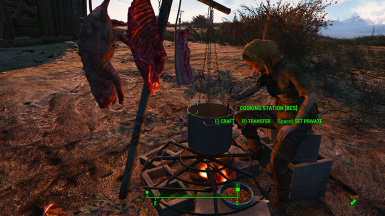 v2.03 - Stoves assigned to settlers now give a settlement food bonus as intended. v2.02 - The "I need to assign someone to this" player dialogue is now suppressed on private cooking stations. v2.01 - I removed the ESM flag so the mod can be placed below mods like Children of the Commonwealth in your load order. Fixed missing shimmer effect on the swinging pot cooking fire. Fixed mod conflict issues at Red Rocket and other settlements that had hand-placed fires beneath cooking spits. Settlers can now be assigned to work at cooking stations and will become food vendors, while the stations can still be used by the player for crafting! Assigned cooking stations (excluding kitchen stoves) can be destroyed during raids. Each assigned cooking station type is given a unique container and leveled list for more varied food trading. Cooking stations that have been assigned to settlers give settlement food and happiness bonuses. Added a condition to the "It's growing well" dialogue so it won't play when using cooking stations that give food bonuses. New food categorization: ROAST, SOUP, GRILL, FRY, POACH & BOIL, STEAK, OMELETTE, STEW, SKEWER, BAKE, BEVERAGE, UTILITY. Logical cooking system: you can't craft soup or omelettes on roasting spits and BBQs, or cook grilled steaks in soup pots, for example. Recipe for purified water moved from BEVERAGES to UTILITY, and 1 dirty water produces 1 clean water. Vanilla and DLC cooking recipes now use purified water instead of dirty water. No need for a separate mod to do this. Added new recipes to craft cooking oil from corn, razorgrain, mutfruit, gourds and melons, including all wild varieties, plus glass for the bottle. Cooking oil now scraps into oil + glass instead of oil + plastic. Added new cooking recipes for Blamco Mac and Cheese, Cram, Fancy Lad Snack Cakes, Insta Mash, Pork'n'Beans, Potato Crisps, Salisbury Steak, Sugar Bombs, Yum Yum Deviled Eggs and Bobrov's Moonshine. Added new recipes to turn wild or vault ingredients into regular ingredients. No need for a separate mod to do this. Added an Easter egg food item Soylent Green included in some food trader leveled lists. A Far Harbor patch for its new recipes and ingredients. Applied the new recipe categories and logical cooking rules. 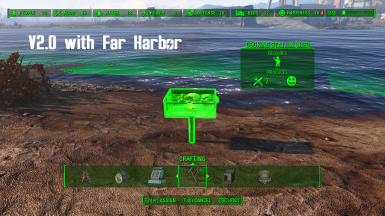 Added a fully working craftable Far Harbor picnic grill with fire, smoke and sound effects. I shortened the pedestal to make the model fit the player cooking animation without clipping. 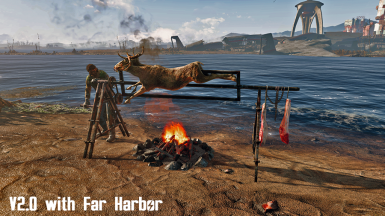 Added an alternative cooking spit with a Far Harbor dead buck roasting on it. Made a Nuka World patch for its new recipes and ingredients. Applied the new recipe categories and logical cooking rules. Made an all-in-one patch for Wasteland (Mojave) Imports, including my Far Harbor and Nuka World patches. Made a compatibility patch for Choice Chopped. Made a compatibility patch for Logical Recipes. Bonus: the patch also updates Logical Recipes to be compatible with Survival Mode. Made a compatibility patch for Have a Beer - Animated Drinking. - Optional compatibility patches can found in the Optional Downloads section. They are mainly needed to allow custom food items to appear in the new recipe categories in accordance with the new 'Logical Cooking' system. Your game won't break or crash if you don't use these patches (thus they are optional), but the custom food items will appear in the vanilla categories on all cooking stations instead of in the new categories on specific cooking stations. Recipes, Animated Drinking and Choice Chopped after Better Cooking Stations. Then put the patches after those mods. - If you can't cope with all the new features and possible incompatibilities, the original v1.0 version is still available for download. CBM Survival of the Fittest => COMPATIBLE. There's a very trivial conflict in the names of Institute Gourd and Warwick Melon. Choice Chopped => COMPATIBLE with a patch. CraftableCookingOil => REDUNDANT. Better Cooking Stations includes a variety of recipes for crafting cooking oil. Eat Sleep Drink => NOT COMPATIBLE. The mod was made before Survival Mode came out and is severely out of date. 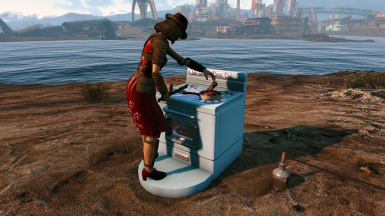 Far Harbor DLC => REQUIRES A PATCH to benefit from new features in Better Cooking Stations v2.0. Fill'em Up Again (RecycleBottles) => COMPATIBLE. No conflicts. FROST => COMPATIBLE. Load Better Cooking Stations AFTER Frost to fix a very minor conflict. Give Me That Bottle => COMPATIBLE with a patch. The patch works with either the regular or Valdacil's Item Sorting version of Give Me That Bottle..
Have a Beer - Animated Drinking => COMPATIBLE with a patch. Hobo-Scavenger => COMPATIBLE. No conflicts. Hydrating Survival Beverages => COMPATIBLE. No conflicts. Logical Recipes => COMPATIBLE with a patch. The patch also makes Logical Recipes compatible with Survival Mode. NoDirtyWaterRecipes => NOT COMPATIBLE. 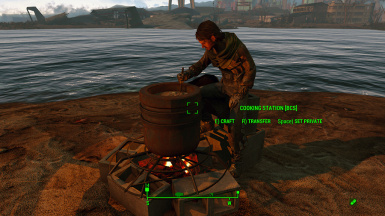 Better Cooking Stations now includes purified water recipes and also updates the Far Harbor chicken soup recipe. Northland Diggers => COMPATIBLE, no conflicts. Nuka World DLC => REQUIRES A PATCH to benefit from new features in Better Cooking Stations v2.0. Orphans of the Commonwealth => COMPATIBLE but you must load it BEFORE Better Cooking Stations. Valdacil's Item Sorting ==> Better Cooking Stations edits 6 food items, so these won't have sorting tags (Buzzbites, Institute Gourd, Warwick Melon, Mirelurk Egg, Bobrov's Best Moonshine and Soylent Green). I'm not going to make a patch for this, it's a very minor issue. Wastelander Cookbook => NOT COMPATIBLE. The mod was made before Survival Mode came out and is severely out of date. Wastelander (Mojave) Imports => COMPATIBLE with a patch. My patch for this also has the Far Harbor and Nuka World patches built-in. Wild Fruit Conversion => REDUNDANT. Better Cooking Stations now includes recipes to convert wild and vault ingredients to regular, and includes some ingredients that Wild Fruit Conversion missed. Wild Harvestables => COMPATIBLE, no conflicts. Wild Plants Farming => COMPATIBLE, no conflicts. Workshop Rearranged => COMPATIBLE, but you must load it BEFORE Better Cooking Stations v2.0 or it will prevent settlers from being assignable to certain cooking stations. [PC ] CWSS Redux - Craftable Working Showers Sinks Baths Toilets Urinals etc by steve40 & FLipdeezy. [PC|XB1|PS4] Swinging Animated Meat Bags. [PC] See You Sleep - Common Wealth Edition animated sleeping by FLipdeezy & steve40. [PC|XB1] Better High-Tech Lights - on-off switch bugfix and more. [PC|XB1|PS4] Better Artillery Signal Flares - invisible wall bugfix and more. [PC|XB1] Better Homing Beacons - invisible wall bugfix and reliable missile strikes. [PC|XB1] Port-A-Diner Perfection - grab that perfect pie by steve40 & cat_woman1989. [PC|XB1|PS4] Radio Silence - silent standalone radio station. [PC|XB1] Burning Campfires That Hurt by steve40 & Necrocytosis. [PC|XB1] Buildable Burning Campfires and Fireplaces by Necrocytosis and steve40.